App + PDF (278 pages) Free Medical Journals - Over the next years, the most important medical journals will be available online, free and in full-text. The unrestricted access to scientific knowledge - the new standard in medical publishing - will have a major impact on medical practice. Only original research and review articles are free after 12 months. Articles 1996-2008 are free. Only part of content, since 2009, is freely available. Title was 'Japanese Circulation Journal' until 2001. Changed title, since 2005, to 'International Journal of Obesity'. Title was 'Europa Medicophysica' until 2007. Amedeo's smartphone edition. 100 topics. Free weekly literature summaries. 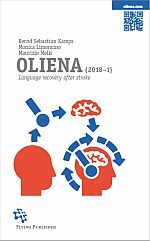 Language recovery after stroke. 9000+ videos in English, Spanish, Italian and Sardinian. A short guide to fast language learning. By Bernd Sebastian Kamps. 76 pages. Free PDF.